How small can you go with a large SUV? 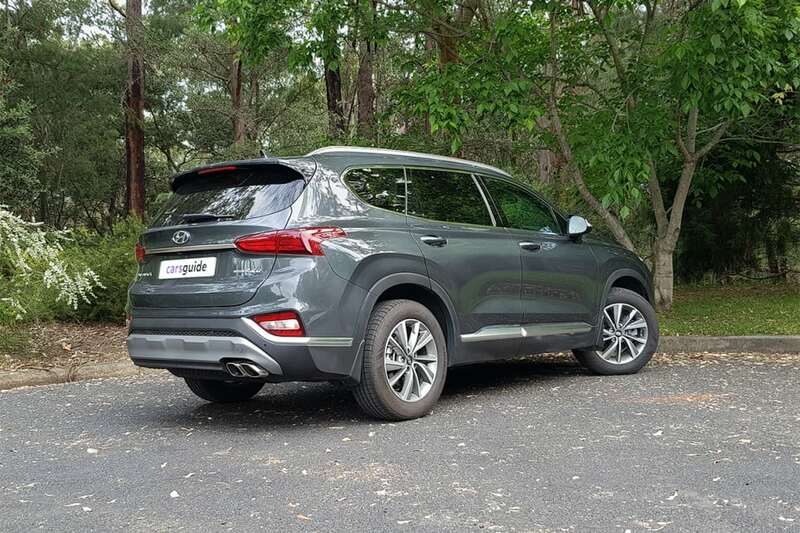 Malcolm Flynn is spending six months with the new Hyundai Santa Fe Elite, to see how well it fits his family’s needs. Our acceptance of the dual flush toilet is one of the simplest yet smartest adjustments Australia has made in my lifetime. You only use what you need, and everyone benefits. 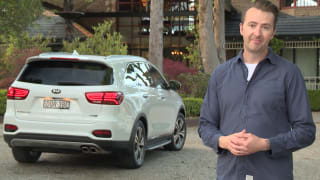 I’ve also seen the emergence of the SUV, which now sees the versatile, jacked-up wagon bodystyle outnumbering the combined sales of hatchbacks, sedans, wagons coupes and convertibles in Australia. They’re not just a big deal, they are the new face of motoring. But unlike the handy but simple two toilet buttons, the SUV market has exploded to include at least nine different size classes and sub-categories. So there’s no point in going for the full flush SUV unless you really need to, and there’s plenty of other options if you don’t. Since my first child arrived a little over a year and a half ago, I’ve proven you can achieve a whole lot with a mid-size SUV. We started at the smaller end of the mid-size scale with the Tiguan, before the more mainstream Escape, the slightly smaller CX-5, the roomiest-in-class CR-V and then having our cake and eating it with the Golf R wagon. The arrival of my second baby was made easier with the extra space in the CR-V, but we proved it wasn’t ultimately necessary with the much lower and much faster Golf R wagon. Plenty of people go straight for a large SUV as soon as #2 is on the horizon though, and I don’t blame them. When you’re ferrying infants, you’ll always find something to fill any gaps you might create by choosing a larger car. Aside from the often borderline front seat space ahead of a rear-facing baby seat, the most iffy element we’ve identified with carrying two babies is whether Grandma (or a polite parent) is able to sit between two child seats in the back, AND put their seat belt on. The CR-V had lots of room up the front for my 172cm height ahead of the rear-facing seat and just enough room for a nimble Grandma to access and belt herself in the middle, but the Golf wagon just passed the first test and failed the second. The CR-V is just right for my family, if equipped with the full suite of safety gear that will still set you back $44,290, but in the interests of making Grandma even happier, the time has come to try something the next size up. Enter the newest large SUV on the market for the job, with the fourth-generation Santa Fe hitting showrooms just last month. It’s 174mm longer than the CR-V, 35mm wider, just 1.0mm taller, and rides on a 105mm longer wheelbase, so only really marginally larger despite the Santa Fe being firmly classified as a large SUV unlike the mid-size CR-V. 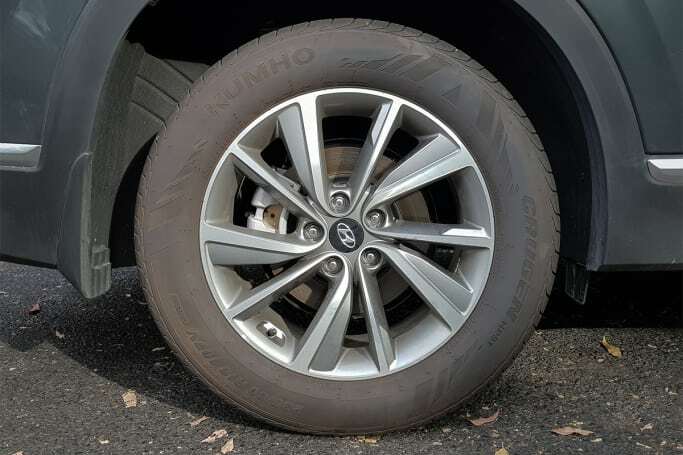 The Hyundai is, however, 10mm shorter, the same width and 5.0mm lower over a 15mm shorter wheelbase than the Kia Sorento it shares much of its structure and underpinnings with. 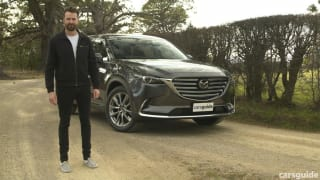 Large SUVs certainly get much bigger again, with the Mazda CX-9 for example being 305mm longer, 79mm wider and 67mm taller on a 165mm longer wheelbase than the Santa Fe. So the Hyundai is a good way to go large SUV if you’re feeling a bit nervous about overall size. 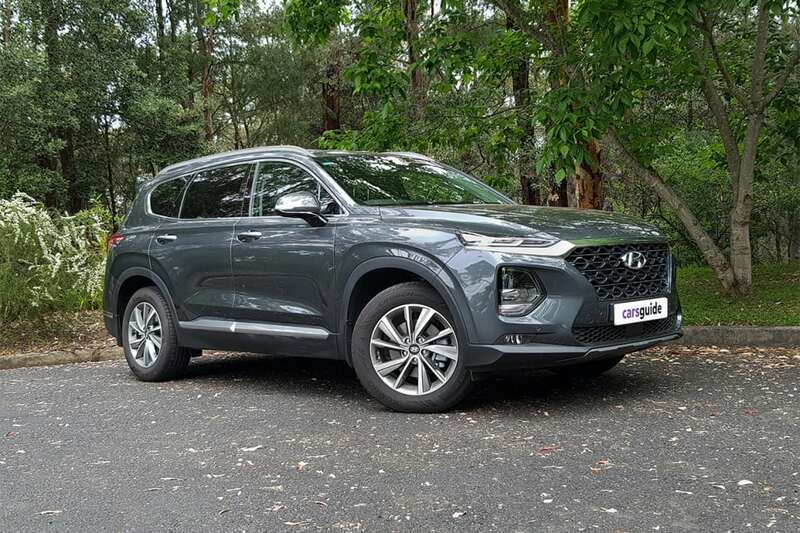 Given Richard picked the Elite as the sweet spot of the Santa Fe line-up at its Australian launch, we’ve elected to go with the mid-spec variant for our test. Australia seems to agree too, with Santa Fe sales skewing in favour of the upper end of the range. The $54,000 (before on-road costs) Elite sits $11,000 and $8000 above the petrol and diesel versions of the base Elite respectively, and $6500 beneath the top-spec Highlander. The Elite comes standard with leather trim with power front seats, 8.0-inch multimedia screen with built-in sat nav with live traffic updates and lifetime updates, Infinity premium audio, dual-zone climate control, chilled glove box, tinted rear windows, rear window sunshades, proximity keys, front parking sensors, auto wipers, powered tailgate, power folding mirrors with puddle lamps and 18-inch alloys. The Elite gets 18-inch alloy wheels. This is on top of the base Active’s Apple CarPlay and Android Auto, active cruise control, reversing camera with rear parking sensors, auto headlights, and front and rear fog lights. The Elite also comes with the brilliant 'Rear Occupant Alert' (ROA) function, which intends to prevent you from locking the car with a child or animal sitting in the back. A motion sensor in the roof detects movement and a chime will warn the driver when switching off the engine, or honk the horn if the car is locked. Another safety USP for its class is the Elite’s 'Safe Exit Assist' (SEA) system, which is designed to warn the driver if a vehicle is approaching from the rear to prevent you from opening your door into traffic. 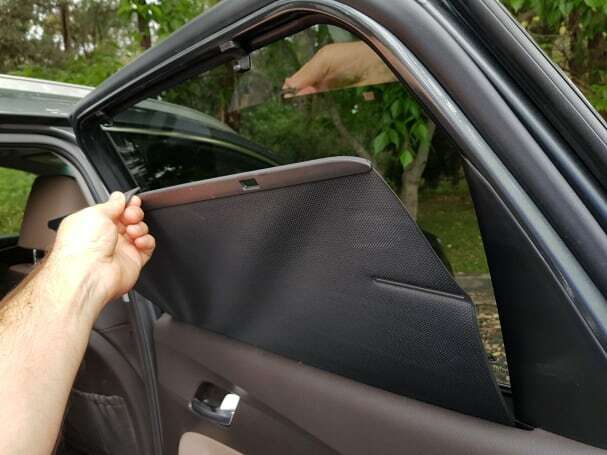 It will also prevent the driver from deactivating the rear door child safety lock if an approaching hazard is detected, and there protect rear seat passengers also. All Santa Fe variants now come with AEB capable of detecting pedestrians and cyclists, along with blind spot warning, rear cross traffic alert, lane keeping assistance, plus active cruise control. The third row still lacks proper curtain airbag coverage though, designed to cover the window area rather than the rear seat occupants. 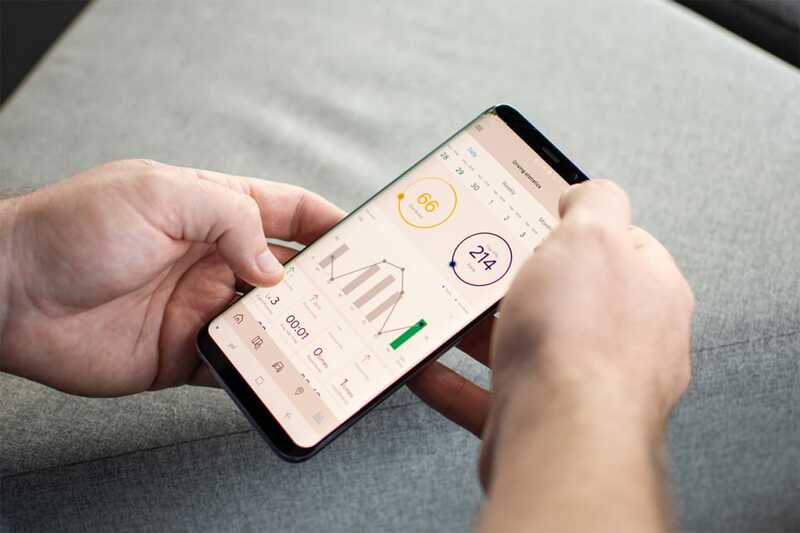 The new model is also yet to be rated by ANCAP, but is expected to carry over the maximum five star ratings applied to the previous two generations. The Elite is only available with the 147kW/440Nm 2.2-litre turbo-diesel engine, paired with an eight-speed torque converter auto and Hyundai’s new 'HTRAC' all-wheel drive system. The Elite’s official combined fuel consumption figure is 7.5L/100km. The Elite is only available with the 147kW/440Nm 2.2-litre turbo-diesel engine. This is the first time my family has lived with a diesel for longer than a week, so we at least look forward to less frequent trips to the servo. Our Santa Fe Elite story actually started before its launch, with Hyundai offering taste tests of the small Kona and mid-size Tucson before gorging ourselves on the big Santa Fe. 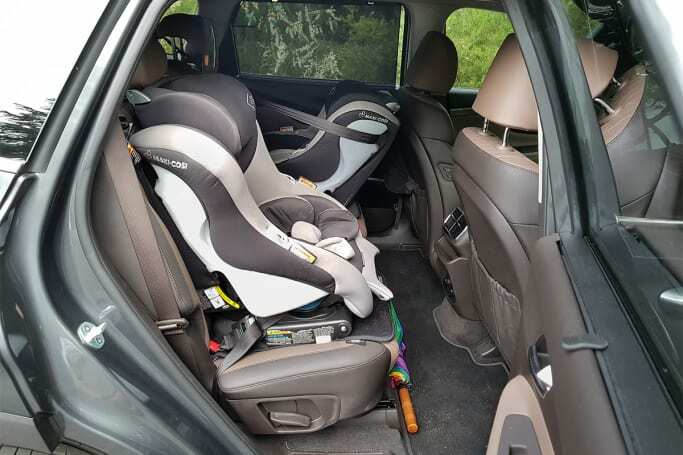 We expected the Tucson to be just right for us with two baby seats, and it was. Enough room up the front ahead of the rearward-facing seat and a generous boot with a full-size spare under the boot floor. 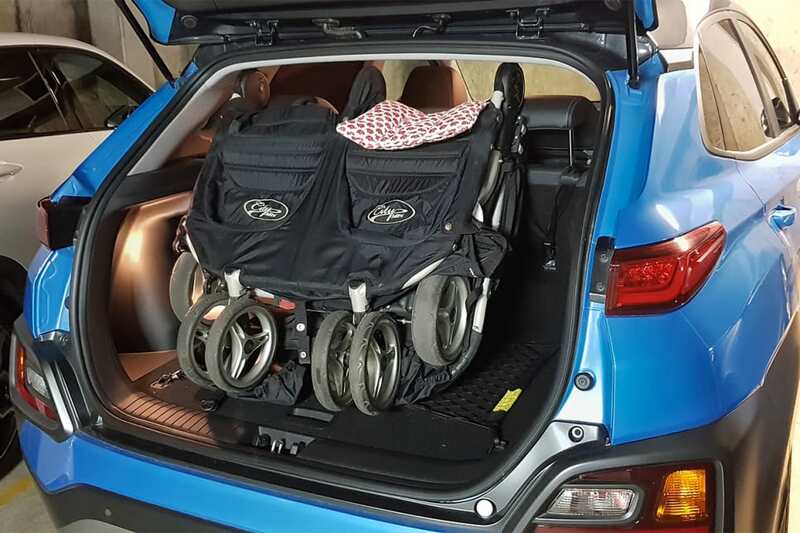 The Kona was more of a walk on the wild side, but we found the front seat space ahead of the babies to be much the same as the Tucson, despite the smaller SUV having a 70mm shorter wheelbase. 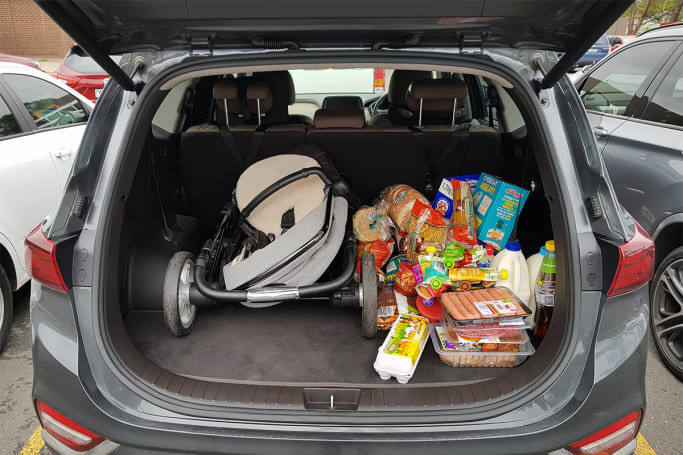 The boot was understandably more of a squeeze, but if you loaded it carefully, our twin stroller would fit without interfering with the hatch closing. 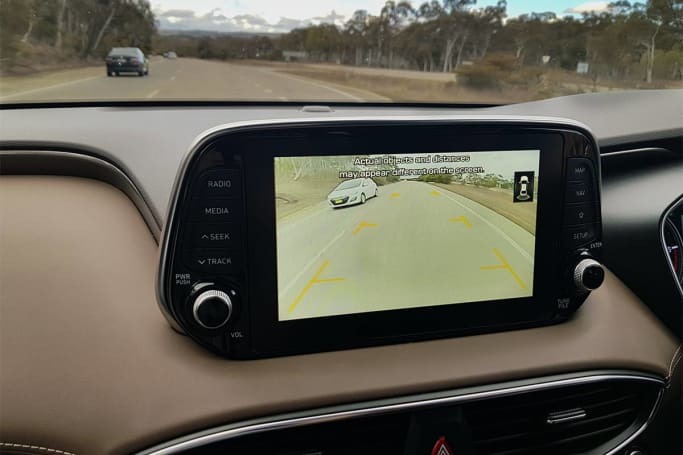 It did interfere with rearward vision though, so not the ideal solution. For the record, it also easily fit the nappy and snack bag which are essential for day-to-day parenting, and could probably handle a weekend away if we packed our luggage in several smaller soft bags. Myth busted: You can get away with two babies in a Kona. Although, it limits rear visibility. So the Santa Fe Elite’s arrival was welcome, and with 1018km on the odo it soon had the two seats ISOFIXed in the back. Which brings me to our first large SUV busted myth. We’re not likely to get much use from the third row of seats given you can only access them from the boot with two outboard child seats fitted. Outboard child seats make access to the third row impractical. We’ll go into the drive experience in more detail later, but after 1710km of largely urban driving in our first month, the Elite has managed a decent 7.68L/100km of diesel use. That’s around one litre better than what we’ve seen across the mid-size SUVs we’ve had, but not as significant as you might expect from the completely different fuel type. Our second month with the Santa Fe kicked off with a weekend jaunt from our home on the eastern edge of the Blue Mountains to visit my parents in Canberra. So three hours on the motorway in each direction, with the kids in tow and the boot set for a free-for-all. Fold the third row down and the Santa Fe feels like a CR-V. The trip down was a snack, with the boot feeling eerily CR-V-like with the third row of seats folded. The big win was completing the whole journey non-stop, which had been a question mark given it was the first time we’d attempted it with two kids aboard and ultimately a trial for our five-month old. It could just be that I spawn travel-happy kids, but the Santa Fe at least deserves some credit. 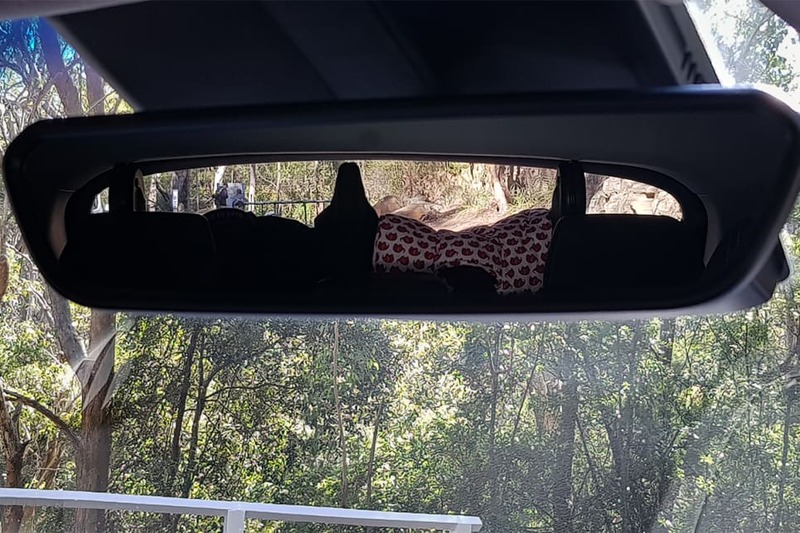 Aside from its Australian-tuned suspension being tweaked to handle our roads as well as possible, the Elite’s particularly dark rear privacy glass and retractable window shades are no doubt big contributors to infant comfort. These are a great idea, and the latter saves you from fitting ugly mesh socks to your back windows. Kids don't always want the windows blocked though, and this new model's much flatter window line results in a big improvement for back seat visibility over the previous Santa Fe. Theoretically this also helps prevent car sickness, which is always a good thing. The Elite’s retractable window shades help infant comfort. 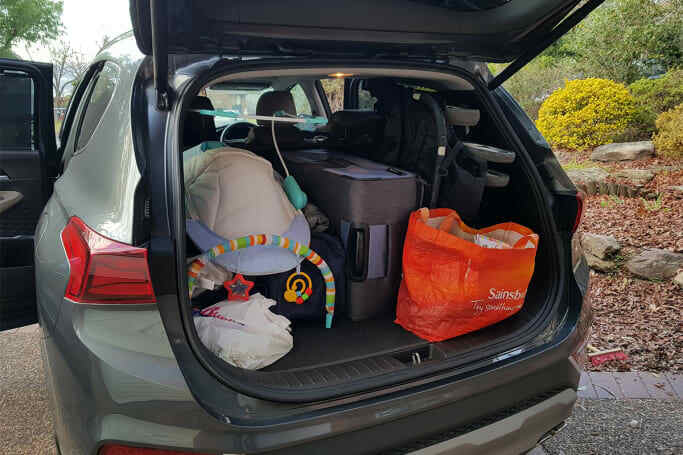 Grandma seized the opportunity to cram more into the boot for the return leg, with a couple of bulk boxes of nappies from Costco filling the rear vision from the driver’s seat. Confidence was soon restored with the discovery of the Santa Fe’s ability to leave the reversing camera continuously on while cruising. This would also be very handy for keeping a close eye on a towed load. Leaving the reversing camera on can help with big cargo loads. Aside from the Canberra run, it was urban business as usual with a few motorway runs to Campbelltown thrown in. Our average over this month’s 2291km surprisingly jumped to 8.16L/100km given the proportion of motorway driving, but we did see the dash figure reach a new low of 7.0 after sustained 110km/h cruising. The Hyundai Santa Fe is priced from $43,000. Santa Fe sales skew in favour of the upper end of the range. It’s funny to think that my kids have arrived in a world where even touchscreens are a bit old school, let alone buttons or even the analog dials that could make finding a radio station akin to neurosurgery. The ability to sit in the car and ask for pretty much any multimedia function by prefacing it with “OK Google” is pretty handy stuff, but my 2016 and 2018 model year babies will never know any different. My 22-month old has even started to echo our commands like a parrot. I’m sure it won’t be long before he asks the car for music rather than his parents. I’m talking about Android Auto if you haven’t had the chance to try it, which in my case with the Santa Fe simply means plugging my phone into the correct USB in the dash and asking away. It’s all well and good to have a dealer show off such features in the controlled environment of the showroom, but the most impressive part for me is that it actually works, at least 80 per cent of the time. It seems to get to know the phone user’s speech patterns too, allowing more and more casual pronunciation the more you use it. This also makes it less responsive to other passengers’ commands, which is a pretty good thing if you think about it. If only it could remind me to pack the reusable shopping bags before heading to the supermarket. I’ll get there one day, but for now the Santa Fe is continually copping loads of loose groceries in the boot. I’ve managed to get as far as keeping a fruit box at home to make unloading easier, but I’m fearful of losing a handful of grapes down folding seat crevice in the meantime. You don’t want to discover that situation with your nose. Any tips? Please share in the comments. Don't you hate forgetting reusable bags? One seemingly unavoidable reality of shopping centre carparks is the wayward trolley. And I’m afraid it was the Santa Fe’s turn this month, copping a handful of surprise scratches behind the right-rear door, despite my staunch discipline of parking it uphill and away from other shoppers. At just four months old, this Santa Fe is already off to the panel beaters. 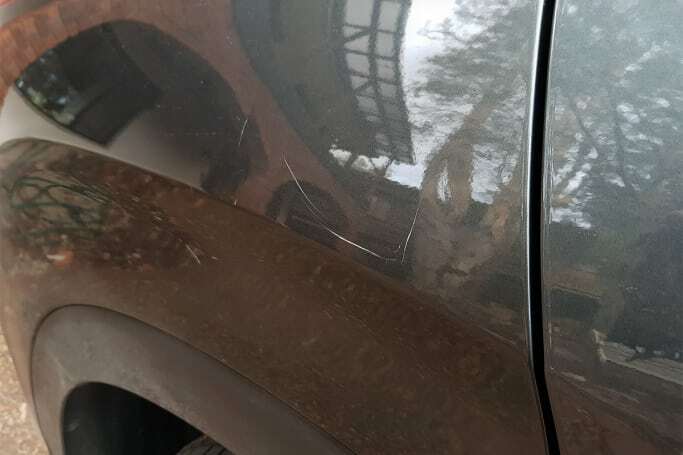 It’s never a pleasing sight to discover damaged paintwork, but it’s particularly galling when it’s someone else’s car and a model so new you’re still pointing other examples in traffic. So it’s off to the panel beaters for NBT60D, at just four months old. Call me old fashioned, but I still can’t send a dirty car off to be worked on, so gave it a good bath before it’s date with the spray booth. This was a good chance to give Mr 22 months his first car washing lesson, which embarrassingly was the first time it had seen soap in four months! I blame the Magnetic Force colour, which still looked reasonably clean from 20m away. Never too young to learn the fundamentals. Aside from the rough and tumble of supermarkets, it’s been otherwise a quiet month for our Santa Fe, racking up just 766km of around town driving. Our 8.4L/100km fuel consumption average for the month was’t bad considering last month’s motorway-heavy driving was just 0.24L better. Our Santa Fe returned from the doctor looking good as new thankfully, but also gained new special powers. 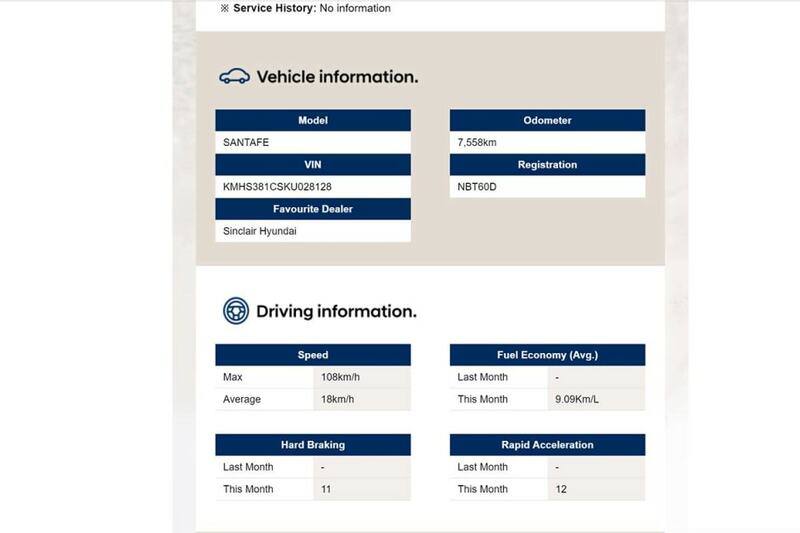 Our friends at Hyundai HQ had taken the chance to set up Auto Link, which has given me a remote view of the Santa Fe’s status and some hand-of-God controls via my smartphone. All new Santa Fes (in addition to i30, Kona and Tucson) come fitted with Auto Link as standard, but ours had snuck under the radar by being one of the early launch vehicles. 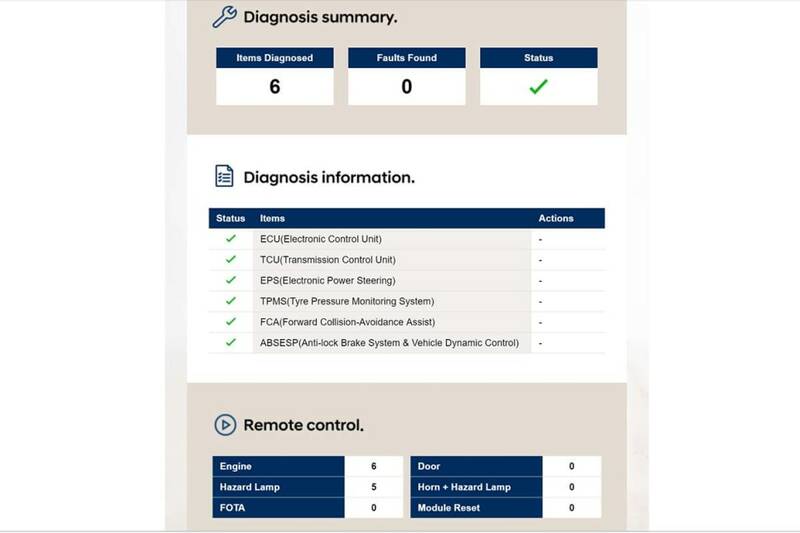 There’s two levels on offer, with the base Auto Link Bluetooth giving a remote view of trip computer functions, tyre pressures, driving history, crowd comparison of data, vehicle location and will alert you of mechanical issues and enable contact with roadside assistance or available service locations. The Santa Fe Highlander comes standard Auto Link Premium, but is a $495 option on lesser grades. This cost is partially explained by requiring its own SIM. Our Santa Fe thankfully scored the more advanced version, which adds the ability to remote start and stop the engine, lock and unlock, adjust the climate control and demister, hazard light and horn control, set up geo-fencing alerts and also automatically send messages if the vehicle is involved in a collision. What does this all mean? At the very least, you can dazzle fellow dinner party guests by starting the car from the table, but also handy for keeping tabs on the vehicle’s location if you’re generous enough to give someone else a drive. You can even set up access for two devices at once, so Dad can spy on Mum as much as she does he. It’s actually a godsend on hot (no doubt cold too) days, by allowing you to start the air conditioning before you get to the car. No, not the greenest of notions, but very much in the kids’ best interests. You’ve just got to remember to do it, which is a bigger challenge than you might think. One element worth remembering is that Auto Link users are also eligible for a 4c/litre discount from participating Caltex fuel stations, every time you fill. You just scan the QR code in the app when paying. All this Auto Link reflection has been facilitated by a surprise lengthy hospital stay for one of my nearest and dearest. What better way to explore the ins and outs of an app than by spending days bedside in a ward? 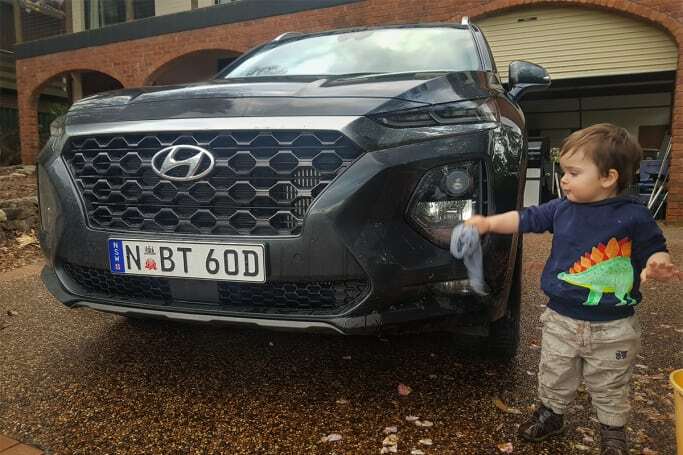 As a result, there’s little more to say about the Santa Fe this month, as it really just played the role of family truckster from home to the hospital, to daycare, the supermarket, then home to the tune of 795 supportive kilometres and racking up another 8.4L/100km average consumption, again. 108km/h. It may not sound like much, and thankfully it isn't, but that's what the Hyundai gods I know as Auto Link reported in my email inbox on December 1. Our Santa Fe's maximum speed for the month of November that is, which makes me mighty glad I'm not an adventurous P-Plater borrowing the car from Mum and Dad. I'd feel very differently if I were said parents though. That's the headline figure in the Auto Link Vehicle health report, which along with odo reading, average speed and fuel consumption, it also presents a tally of hard braking and acceleration instances. There's also a fault report (thankfully zero), and a rundown of what remote control functions you use. So even if you never access Auto Link from your smartphone, it will regularly send the big info to your inbox. Even if you never access Auto Link from your smartphone, it will regularly send the big info to your inbox. 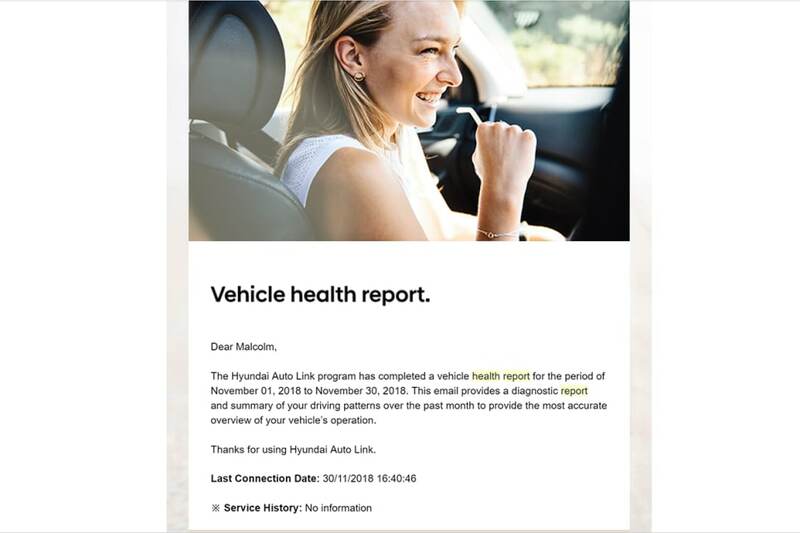 The Auto Link Vehicle health report, includes maximum monthly speed, odo reading, average speed and fuel consumption, it also presents a tally of hard braking and acceleration instances. Auto Link isn't perfect though, with the – understandably necessary - need to enter a PIN before any remote command somewhat negating the convenience. 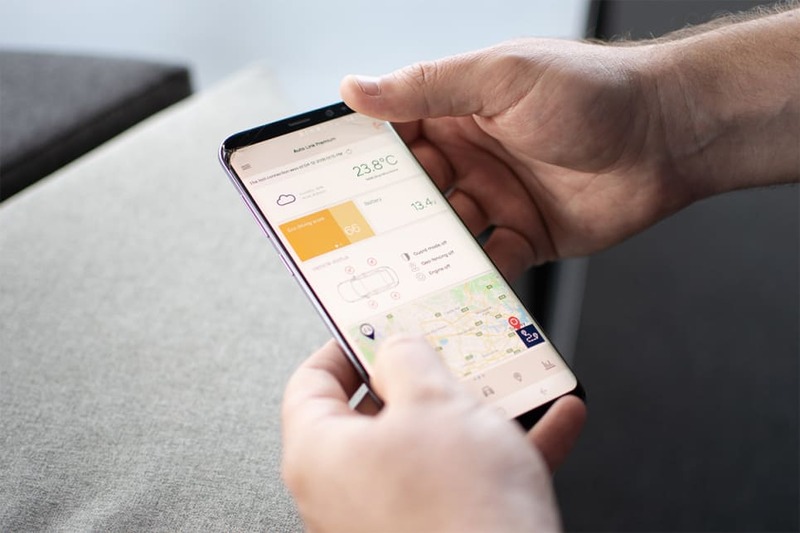 The Aussie-developed app is also buggy at times, with the login screen appearing for a few seconds almost every time you open the app, before remembering that you're already logged in. We're also yet to successfully adjust the climate control temperature from afar. It will turn on when you remote start the engine, and the dial will move on the app interface, but we're yet to see this remote-entered temperature setting appear on the car. The most frustrating bug though, is how the remote start function tends to fail at the last moment about half the time, sending a 'failure' alert. This is annoying when you're trying to chill the car as you approach, but downright embarrassing when you're trying to show off your real-life KITT from Knightrider functions to friends. 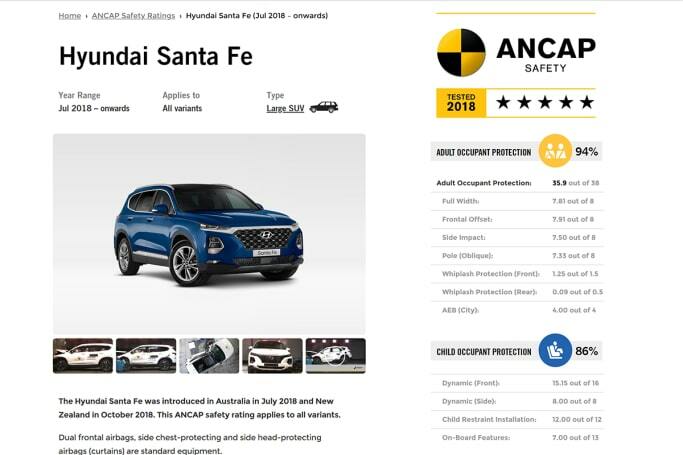 Hyundai's confidence in the new Santa Fe's safety cred was also somewhat verified this month, with ANCAP announcing that all variants are worthy of the maximum five-star safety rating according to 2018 standards. ANCAP's testing also revealed a production fault with the side curtain airbags on the vehicle tested, which has been rectified via a recall of other affected examples. I do question the validity of this maximum star rating though, given the Santa Fe still lacks proper third-row occupant curtain airbag coverage – unlike some of its key rivals. While it's of no consequence to my present family needs with two baby seats effectively blocking the third row, but how do you choose which occupants go airbagless when you do need to use the extra seats? A couple of comments from Damon and Trev regarding the Elite's drivetrain this month means its probably time for me to summarise my thoughts so far. Cheers guys. 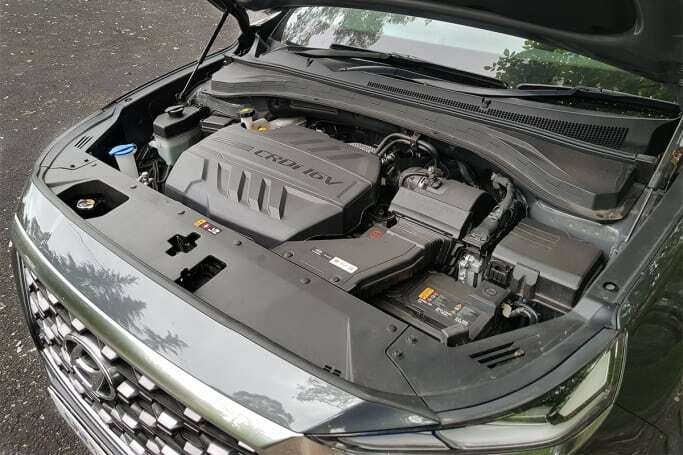 I had hoped the fourth-generation Santa Fe would follow the experiment with the previous ActiveX by returning a petrol V6 option to the line-up, as the same engine available overseas has proven to offer decent real-world economy, excellent refinement and performance in the Kia Sorento that shares much of its underpinnings with the new model. Not to be though, with the Elite and Highlander Santa Fes continuing with the 2.2-litre turbodiesel (albeit now producing 147kW/440Nm and paired with an eight-speed auto) that's effectively been in use since the second-generation model. There's nothing inherently wrong with it, but it's not proving to be that efficient and three generations is a hell of a lifespan for any engine. I wouldn't mind another more refined and faster option in the higher spec models at least. The new auto does a fine job though, with no sense of overly efficiency-focused ratio holding you experience with numerous autos these days. Another option that could help would be the 2.0-litre turbo engine available in the US and seen here in the Sonata. With 180kW and 353Nm, it'd surely offer an acceleration and refinement advantage over the diesel, while still delivering decent fuel economy on Regular 91 Unleaded. Perhaps later in the Santa Fe's model life Hyundai? One weekend this month, good luck found the i30 N hot hatch in my driveway for the first time since launch. This thing is just as good as we all first thought, and an absolute credit to the team behind it. 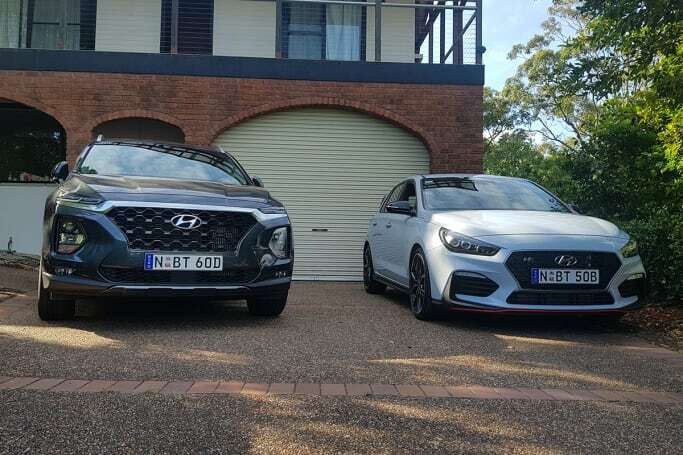 The point of mentioning this is that it put the most exciting Hyundai of all time beside its new flagship for passenger comfort on my driveway at the same time. It's starting to sound very cliched, but this brand has come a long way from having $13,990 drive-away pricing as its only selling point. One weekend this month, good luck found the i30 N hot hatch in my driveway for the first time since launch. With the i30 N scratching my fun driving itch for the month, our Santa Fe driving pattern didn't seem to deviate much from the urban-heavy previous month. Our average fuel consumption jumped by a full 1.25L/100km to a 9.65 at the pump figure, however. Perhaps it was due to more use of the air conditioning in the intensifying summer heat, or perhaps we just did more trips up and down the mountains than usual. It'll be interesting to see what we turn up next month. Is it January already? Don’t worry, I’m not about to also pull whinging about the summer heat from my small talk artillery, but by crikey our six months with the Santa Fe Elite has gone fast. So fast, in fact, that we haven’t managed to take it on any unsealed roads, let alone off-road. So we’re no different to the classic unrequited adventure SUV stereotype, this time around. That’s not to say our Elite hasn’t worked hard, and it’s actually worked much harder in the past month than any other, covering a full 3199km. In a month! Blame Christmas of course, with multiple family dos scattered all over the city and state, and accentuated by the fact that we live just beyond the very edge of Sydney. This is a great time of year to have a big boot and no need for the third row of seats. 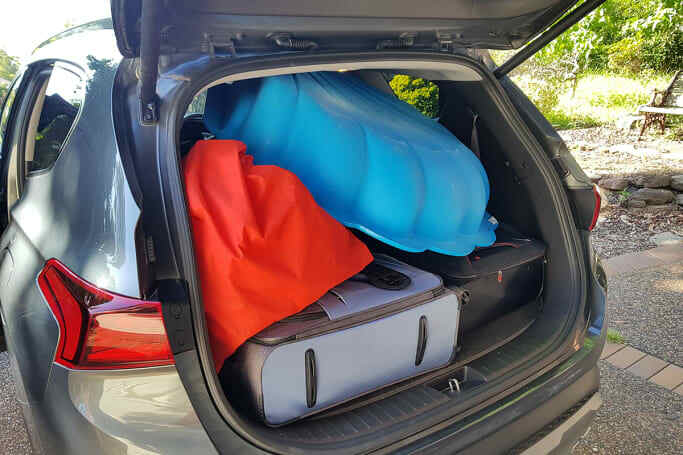 With these folded, we were able to carry everything we could think of for a two day trip to Canberra with the kids, plus a pile of Christmas presents, and then a whole kiddy pool on top of it all. Forget the kitchen sink, how about a swimming pool? This last detail meant we had the reversing camera locked on for the trip for rearward visibility, but it’s pretty close to the old kitchen sink analogy. One life hack I may have invented for this journey was to use the third row aircon controls and directional vent to keep the Christmas trifle cool for the three hour stint in the boot. I may not have grown up enough yet to have a cooler bag and ice bricks at the ready, but that doesn’t matter when you’ve got a Santa Fe. 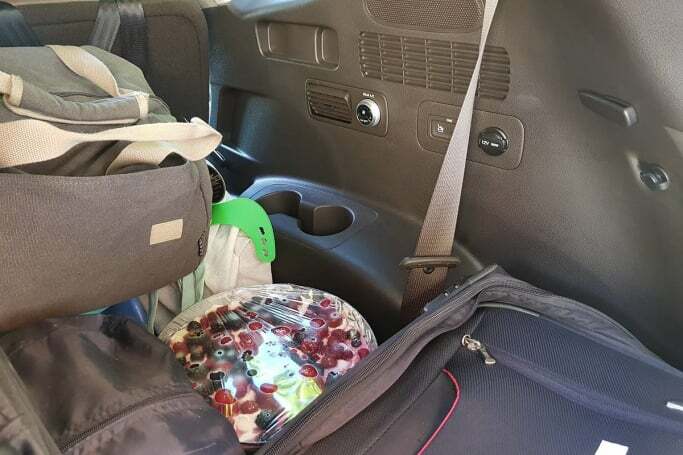 Dessert chilling life hack: Use the third row aircon to keep the Christmas trifle cool. One other ‘boot to capacity’ observation we’ve made is how handy it is that the Santa Fe’s hands-free tailgate opening is activated simply by your presence. It’s still pretty slow to activate, but so much more convenient when you’ve got both hands full of luggage or shopping bags than having to wave your foot under the bumper like a lot of SUVs. It’s also worth pointing out how handy the Santa Fe’s extra storage spaces are. Beyond the crucial bottle holders in each door and cup holders between the front two rows of seats, along with the third row being catered for with more bottle holders and bins on top of the rear wheelarches. the new Santa Fe also has a neat storage slot above the glovebox on the front passenger side of the dash and another handy open bin behind the centre console. We found the former just ideal for wedging in a packet of baby wipes, keeping them visible and within reach for all those baby wipe events, and the former the perfect spot for storing spare dummies. This particular Canberra run also finally gave us the chance to use the third row, when we really needed to jam in Aunty Rach and Mammy for a short trip across town and we didn’t want to take two cars. Aunty Rach pulled the longest straw and scored the front passenger seat, which put yours truly in the middle row between the two babies and 60+ Mammy in the third row. Mine was the shortest straw, requiring plenty of wriggling to latch my seatbelt but it wasn’t too bad for the 20-minute journey. Having the two baby seats fitted meant Mammy had to climb in via the boot though, which after one knee replacement and another due, isn’t the most convenient point of ingress. Once in, she was more than comfortable and we were happy to look past the lack of proper third row airbag coverage for the short trip. 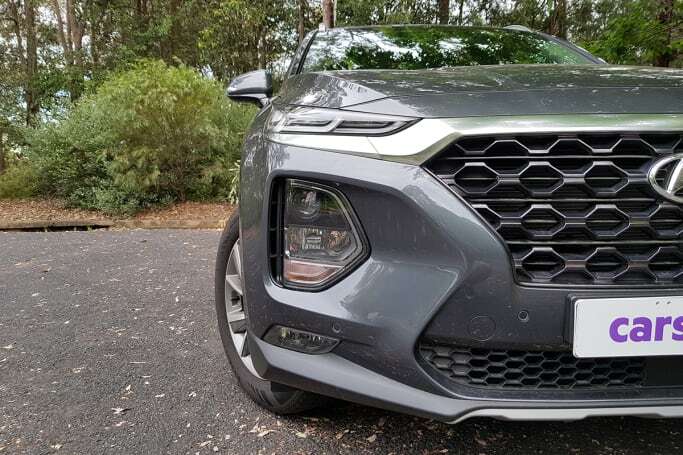 One element of the Santa Fe Elite that really hit home during our epic month on the road is that its headlights really aren’t anything special once you leave the street lights of built-up areas. This is despite the stack of five (!!) lights on each front corner, which from the top down include daytime running lights, then the main beams, high beam, the indicator, and finally foglights down the bottom. Yep, there's five levels of headlight right there. The high beams aren’t too bad, but the Elite’s halogen main beams leave a lot to be desired, particularly given the amount of wildlife around thanks to the drought. This could be better with the Highlander’s LEDs, but I’d be trying a bulb upgrade at the very least if this were my Elite. Overall, it has been pretty handy having more room aboard the Santa Fe than what we’ve had with mid-size SUVs in the past. Any more space with one of the larger large SUVs is probably a bit frivolous for our two adult, two baby family, and to be honest it would make more sense for us to stick to a mid-sizer if we were buying one for the long term. If our family grew any more or if we had to carry Grandma more often or even pets, the Santa Fe would be a really smart choice. The diesel drivetrain hasn’t been the outright efficiency hero we’d hoped for, but with an overall average consumption of 8.48L/100km spanning all conditions over a total of 9459km, it at least matched the consumption we’ve experienced with our petrol-powered mid-size SUVs. The big71L tank has also been mighty handy for spreading out trips to the servo. So any Canyonero-like perception is way off, and the new Santa Fe Elite represents a smart jack-of-most trades buy if you want to go bigger than a mid-size SUV but stick to the smaller end of the large class. The new Mazda CX-9 has been updated again - what could have they possibly changed now? Pretty much everything they needed to and nothing they didn't. 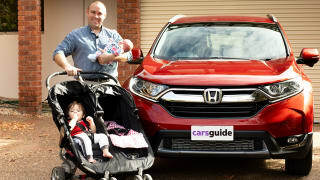 Malcolm Flynn is spending three months living with the two-wheel drive version of the CR-V VTi-S, to see how well it fits his family.